Innate immune modulation by DNA Tumor viruses. I chose the MVM Program at the University of Pittsburgh because the environment seemed very collaborative and there is a diverse virology program. I also liked that the program allowed me to get some teaching experience and provided avenues to present my research through seminars and research symposiums organized within the program. I was also attracted by the growing number of institutes within the university, like the UPCI, which allowed me the opportunity to develop my interest in cancer virology. Most importantly, I chose Pitt because I found it to be very oriented towards fostering the students' potential in and outside of the laboratory environment. This made me realize that Pitt was the place for me to grow as a researcher, but also as a wholesome professional. 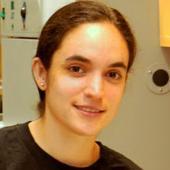 Following her graduation from the University of Pittsburgh, Adriana accepted a position as a Senior Fellow at the University of Washington's Department of Microbiology in the lab of Dr. Michael G. Katze. Forero A, Gjoerup OV, Pipas JM, Sarkar SN. Simian Virus 40 T Antigen Mediated Induction of Interferon-stimulated Genes. 15th Annual BGSA Symposium Pittsburgh, PA, October 18, 2010. Forero A, Gjoerup OV, Pipas JM, Sarkar SN.Simian Virus 40 T Antigen Mediated Induction of Interferon-stimulated Genes. Science 2010, Pittsburgh, PA October 7-8, 2010. Forero A and Sarkar SN. Modulation of Innate Immune Signaling by Kaposi’s sarcoma-associated herpesvirus (KSHV). 22nd Annual UPCI Scientific Retreat. Pittsburgh, PA June 2010. Forero A and Sarkar SN. Role of KSHV-encoded Proteins in Innate Immune Modulation. Molecular Virology and Microbiology Graduate Program 6th Annual Retreat, Pittsburgh, PA, April 30, 2010. Forero A, Ferris RL, Sarkar SN. Role of EGFR on dsRNA response. 14th Annual BGSA Symposium, Pittsburgh, PA. October 2009. Forero A, Niranjan A, Fellows W, Okada H, Codore H, Hong CS, Glorioso JC, Grandi P. Effect of Indoleamine-2, 3-Dioxygenase (IDO) on Replication of Oncolytic HSV Vectors in Glioma Cells. 11th Annual American Society of Gene Therapy Meeting. May 2008. Grandi P, Forero A, Niranjan A, Fellows W, Goins W, Okada H, Klinkenberg D, Krisky D, Glorioso JC. Role of IDO on HSV oncolytic vectors activity. International Symposium on NeuroVirology, San Diego, CA, October 29-November 2, 2007. Grandi P, Forero A, Niranjan A, Fellows W, Bein K, Okada H, Klinkenberg D, Krisky D, Glorioso JC. Design of ICP0 Deficient HSV Oncolytic Vectors for Treatment of Glioblastomas. 32nd International Herpes Workshop. July 2007. Grandi P, Forero A, Niranjan A, Fellows W, Okada H, Klinkenberg D, Krisky D, Glorioso JC. Design of ICP0 Deficient HSV Oncolytic Vectors for Treatment of Glioblastomas. 10th Annual American Society of Gene Therapy Meeting. May 2007.